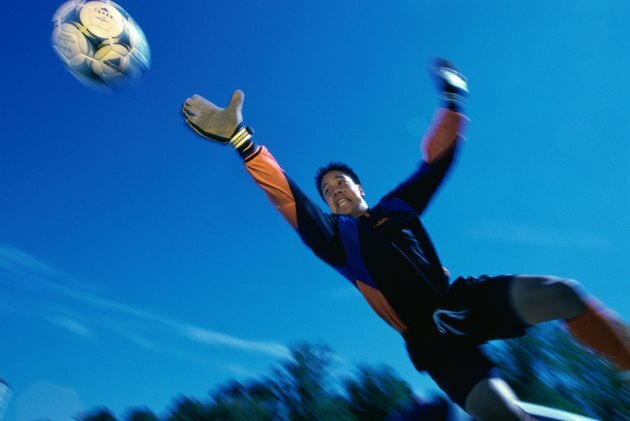 The goalkeeper is a vitally important position on the soccer team. Having a confident and commanding goalkeeper can bring uniformity and self-assurance to the back four, defenders, and the rest of the team. A goalkeeper, although he doesn't score goals, can still win the game for their team with some world-class shot stopping. The times that they can handle the ball do not come without restriction, however. The 18-yard box is more commonly known as the goalkeeping area. This is the keeper's realm of influence, where he can handle the ball freely. The keeper can stop shots or catch crosses from corner kicks or free kicks. He can also throw the ball out to his teammates, sometimes as a very effective counter-attacking move. The goalkeeper is not allowed to handle the ball in the "D" of the box, which is used to give a penalty-taker space. The goalkeeper can handle a pass only when it is delivered by a header or off the passer's chest, or the pass is deemed accidental. If she picks up or touches the ball with her hand in any way when her teammate has kicked it to her, then it is ruled a back-pass and a free-kick is given. As the BBC website notes, this rule was created in 1992 to stop excessive back-passing and wasting of time. Once the goalkeeper has the ball under control in his hands, he has six seconds to release it back into play, according to FIFA. The referee will warn the keeper and then issue him a yellow card for wasting time if he does not release it within six seconds. This is to insure that the game maintains a quick tempo and is spectator-friendly. Upon leaving the 18-yard box, the goalkeeper must abide by the same rules that apply to the other players and cannot touch the ball with any part of her hand or arm. If she does so, he will receive a yellow card or, if stopping a clear goal-scoring opportunity, will be issued a red card and instantly kicked out of the game. Decisions are often very close to call, with the goalkeeper being forced to handle the ball right on the edge of their area in some instances.